Portuguese Man-of-War is actually a colony of organisms, each with its special function. The gas-filled bubble or float is blue to pale purple and transparent. The long, thread-like tentacles can reach up to 15 meters and are armed with thousands of stinging cells called nematocysts. Some tentacles are short and straight and others are long and coiled. 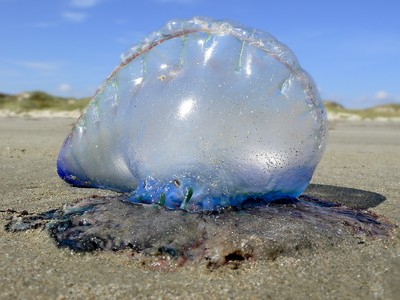 These Man-of-War float on currents and are washed up on Texas beaches during the spring to late summer. They are carnivorous, feeding on small fish and other small animals that get caught in the tentacles. Their primary predators are Sea turtles and Purple Storm Snails. Watch along the beach before going swimming or wading to see if you can find any Man-of War washed up which would indicate that they are in the area. They are sometimes difficult to see in the surf because of the their color and they look like foam from a wave. Besides, with those long tentacles, you may never see the float of the one that stings you. Avoid stepping on beached Man-of-War since the stinging cells remain toxic even when the rest of the organisms have died. Stings produce what seem to be burning rash streaks where the tentacles have made contact. It is important not to rub the area, although this is a natural instinct. You can use a driver's license or credit card to scrape off the tentacles, which are almost invisible. One of the most effective and inexpensive treatments for the pain of the sting is placing the affected area under hot (not scalding) water or applying warm compresses. Non-prescription hydrocortisone cream or antihistamine tablets may relieve the itching rash that may follow a sting. If severe allergic reactions are experienced, medical attention should be sought. Jellyfish - in spite of their name - are not fish. They are invertebrates - relatives of sea anemones and corals. True jellyfish belong to the Phylum: Cnidaria, - class Scyphozoa. Some other animals that are similar in general appearance, such as the Portugese man o' war, are often called jellyfish, but though they are related, scientists do not regard them as true jellyfish. Jellyfish stings are caused by the tentacles that hang from the mollusk. As with Portugese Man-of-Wars - watch along the beach for washed up 'jellies' before going swimming or wading. 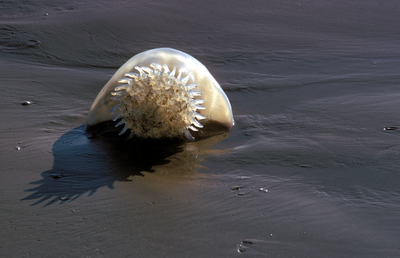 Don't touch dead jellyfish lying on the beach - the stinging cells are probably still active. If you get stung, splash the area with salt water. Then apply a paste of unseasoned meat tenderizer. Don't press the skin. The pain should go away within an hour. Regular vinegar or a solution of one part bleach to 10 parts water also work to alleviate pain.